Using more than 500 flood simulations, scientists were able to calculate roughly how much cash NYC should expect to spend on flooding every year, plus how much the city will lose over the next century if it does absolutely nothing. The results aren’t surprising but no less ugly: Another century floor would cost NYC $2.2 billion. A 1,000 year flood would cost NYC $25 billion. A barrier stretching from Sandy Hook to the tip of the Rockaways, for example, would protect Lower Manhattan. It could also protect the Jersey Bayshore. This is exactly why flood mitigation shouldn’t be looked at municipality by municipality – it should be looked at a region and interstate level. It is estimated that blocking off the entire harbor would cost between $11 – $24 billion. I think splitting the cost on this makes way more sense than individually trying to fight this. Previous What is Highlands Spending Money on? I’ve always loved this project but only drawback is will states cooperate and how long it could take to complete such huge undertaking. Well NY was awarded federal funding from Sandy … and FEMA, the ACE is federal … all backed by federal $$$, not state … so it kinda makes sense. I think a regional solution with towns adjusting their needs and efforts to mitigate local flooding is the best approach. While all in the regional area are in this together, let us remember no one has come to help us as a town yet. So we are still in this on our own at this time. I asked the Army Corps last night if this new shift of policy towards a regional approach (for where to use federal funding) … if it would would impact the federal decision of funding 65% of our wall project? They all smiled and said this type of regional projects approach is a good 50 years out. I do not think that this is a good plan at all. 1) For one the Hudson river deposits millions of gallons of water into the Raritan and Sandy Hook bays not to mention what flows from Long island sound into the east river. then you have the Passaic river, and the Raritan river. all this water flows to the ocean. When you put up a wall where is it going to go? the water is going to go directly to the places you are trying to protect. 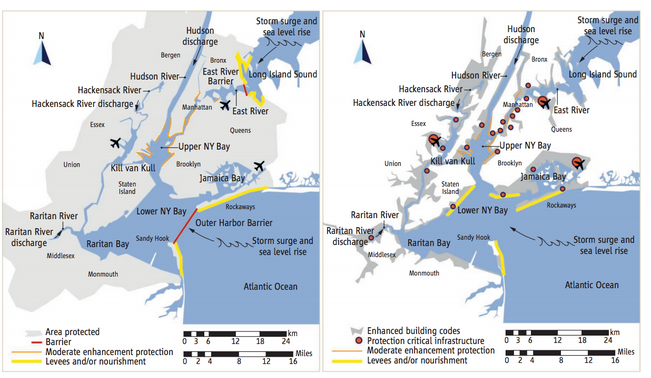 Thereby destroying Sandy Hook and Breezy point and the other low lying areas including lower Manhattan. Wall Street would be flooded within a week because the Hudson river is backing up due to this wall. 2) This would affect trade and international shipping in countless ways and affect the stock market on Wall Street. Think about how the United States would be effected if Oil Tankers cant reach the oil refineries in Elizabeth or the container ships cant reach the port of Newark because of a Wall across the entrance to the Port of New York. This is essentially cutting off New York from World Trade. 3) When the wall is built it would be built over submarine communications cables that have been in existence and usage since the 1800’s. This wall would dump large boulders and rocks on these cables as a foundation for this wall which would sever the cables. New York is a major communications and internet hub this wall would effect international communications by severing its link to the rest of the world. This is beyond a bad idea and the person or persons who thought up this plan should be fired. http://biotech.law.lsu.edu/…/17-outer_harbor_gateway.pdf Read whole thing, includes shipping channels that stays open unless a surge. Would positively protect our area if they built a dune system on ocean side. Also environmentally friendly. I think these engineers know what they are doing and not going shut down communications. DId you read? Sorry for some reason whole thing didn’t paste. Now that I have a better picture of how this wall will work, I still oppose the plan as a bad idea. You just gave me another reason to add to my list. 4) On the traffic plan – there is a roadway/tunnel system built into this wall. Sandy Hook and Rockaway point do not have the roadway/traffic capabilities to handle the increase in traffic that this bridge would bring into the shore. It would siphon money and customers from the Sea streak ferry service and put them out of business as well as the NJ transit train line and Academy bus lines in Leonardo. 5) This would destroy the Fragile Sandy Hook Ecosystem as well as destroy the significance of the Military history of Sandy Hook and Fort Tilden. Who ever came up with this bad idea should be fired and now banished to Alaska. This is the same type of bad idea as the Bridge to Nowhere in Alaska. Actually they are Dutch engineers and the best in field of flood control. Yes let’s banish them great idea!! !